Conceived and performed by Yumino Seki, Aisa Boaa and Mai Nguyen Tri. Lighting Jim Roseveare, Soundscape Nick Weekes and Costume Anoushka Athique. HYAKKI YAKOU is a site-specific Butoh dance performance. The piece was inspired by the Durbar Hall at Hastings Museum & Art Gallery. "Sheer breathtaking physicality and mental application…….."
"Fabulous use of space, time and other dimensions. 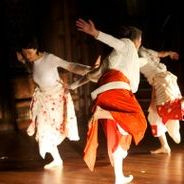 Poetic, peaceful and evocative dance – it moved me to tears"
Funded by Arts Council England and The Japan Society. Kindly hosted by Hastings Museum & Art Gallery and listed in Coastal Currents festival 2013 and the Japan 400 www.japan400.com. DEMONIC spirits, spine-chilling illusion and a fusion of light and sound will take place within the Indian folly at Hastings Museum & Art Gallery in a performance piece created by Japanese dance artist Yumino Seki. Ms Seki, whose work is inspired by the Butoh tradition of avant-garde dance, has choreographed Hyakki Yakou, which translates as A Night Walk of A Hundred Demons. 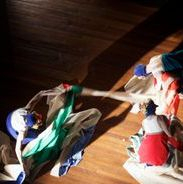 The site-specific performance was inspired by the dark atmosphere of The Durbar Hall at Hastings Museum and is based on the tale of terrifying yet comical demons who were believed to be the spirits of deserted objects in 16th century Japan. Using specially commissioned light and sound effects, and costume, Ms Seki is working with two dancers Aisa Boaa & Mai Nguyen Tri to produce a “kaleidoscopic illusion” within the folly which was built in 1886 and is the centrepiece of the museum. The project, which runs for three nights during the Coastal Currents visual arts festival, is also part of Japan400 which commemorates the 400th anniversary of Japanese-British relations. Ms Seki, 52, who lives in St Leonards, said: “Hyakki Yakou forms a bridge between the cultures of Japan and the UK. 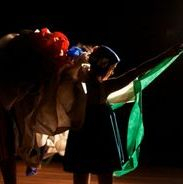 “My aim is to create a performance which incorporates the architecture of the space so that the audience experiences three-dimensional performance with dancers on both levels of the Durbar Hall. Specially commissioned costumes have been designed by Anoushka Athique with sound works by Nick Weekes and lights by Jim Roseveare. Ms Seki, who has been practising Butoh since 1999, is a qualified Somatic Movement practitioner.